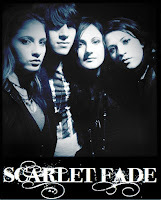 HeirChex Digital Servicing: Scarlet Fade "Revolution"
Out of a basement in CT, the all-sibling band Scarlet Fade, emerged. For 11 years and counting, Ali, Jordan, Jaimee and Jake have worked enthusiastically at crafting their skills of writing and performing. With powerful harmonies and an undeniable onstage passion, the band has won the hearts of audiences up and down the East Coast and beyond. Influenced by bands such as Switchfoot, Flyleaf and Paramore, Scarlet Fade has become increasingly prolific in songwriting. Currently the band has released 3 original projects. "The Faithful and The Bruised", their first full length, was released in 2008. The following year saw 3 Christmas songs released digitally through iTunes. Scarlet Fade's latest release, a 5 song ep entitled "Fixing the Pieces" shows the most growth and has garnered much praise and attention, including that of radio. The band currently has it's eyes on the national platform and is in the process of writing for their next release in the hopes of continuing their success in bringing hope and inspiration to youth as well as people of all ages.